Firstly, let me apologise for the rubbish photos. I was hungry. No way they are going on Instagram. Secondly, this recipe is blatantly lifted (with a few small adaptations) from Smitten Kitchen's gorgeous cookbook, one which I've had for quite a while, but somehow hadn't got around to using. What was I thinking? This is delicious! 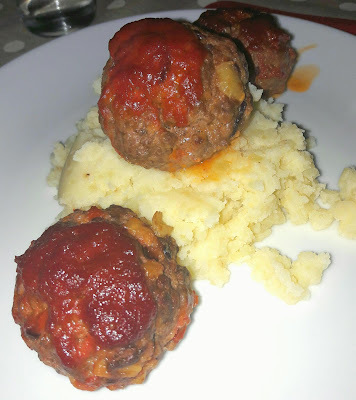 It takes a little bit of effort, but I didn't need to go shopping for any of the ingredients - once I spotted some minced beef in the fridge, I went rummaging for meatball recipes. Ms Pearlman came through for me with these beauties. 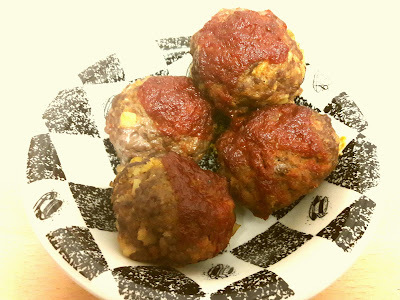 A juicy meatball glazed with a smoky sweet tomato sauce. Delish. Scrum. Mmmm hmmm. Combine all the ingredients for the glaze in a saucepan, and bring to a simmer, whisking constantly. Keep simmering and whisking for about 2 minutes then set aside. Whizz up the baguette into fine breadcrumbs. In a frying pan, sauté the onions, garlic and vegetables for about 15 minutes until very soft, seasoning as you go if you wish. Add the breadcrumbs to a large bowl, mix in the cooked vegetables, and then the rest of the ingredients. Mix together well, then shape into 10-12 meatballs. Line a baking dish with tin foil, then place the meatballs so they are not touching. Spoon a teaspoon or so of the glaze on top of each one. Bake the meatballs for about 20-25 minutes until they are cooked though. Serve with mashed potatoes and drizzle with the juice from cooking. Don't bother taking any photos... just eat and enjoy.